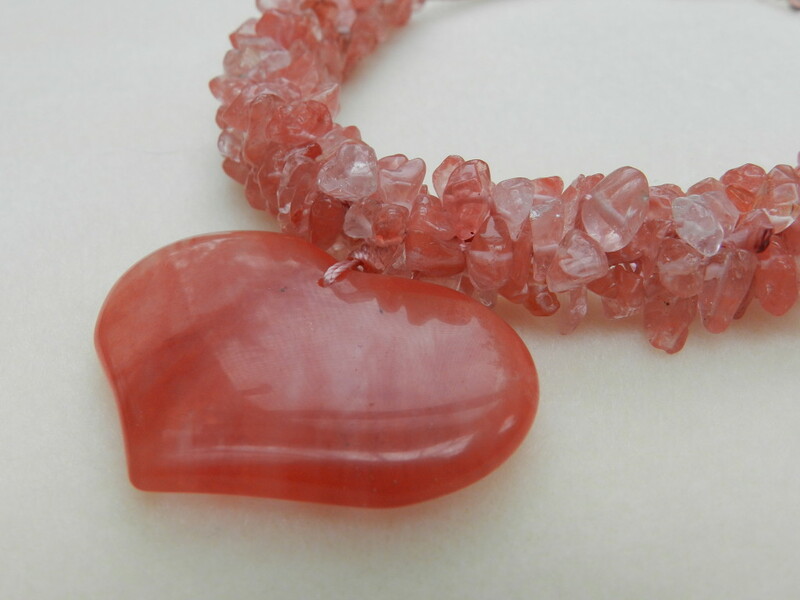 These irregular chunks of genuine gemstone are one of the best and cheapest ways of being able to use the full range of qualities in a particular stone. On a single strand of chips you are most likely to find all the special effects on offer. 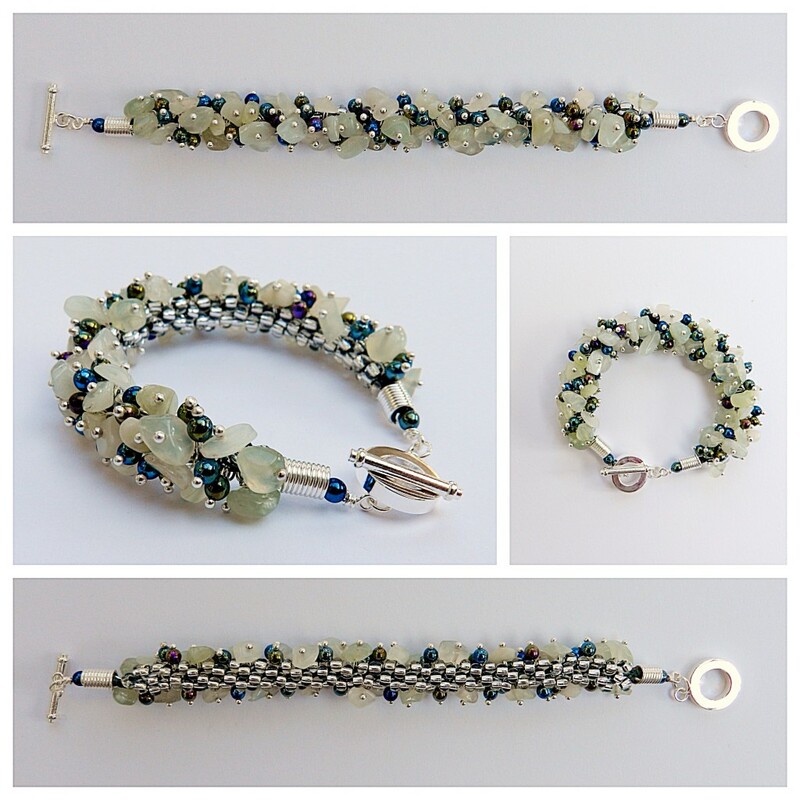 They work best when brought together in a chunky braid and are particularly effective in bracelets. They are available in a range of sizes and finishes. – Hole size. Most chips can easily be strung onto 0.5mm cord. – A long strand. The chips sit closely together in a braid, using up more units than round beads. This is a really simple, but effective bracelet. – Use a large sewing needle and S-Lon to sew the pendant into position after the necklace has been completed. Sew through the pendant and the braid as many times as possible for complete security. 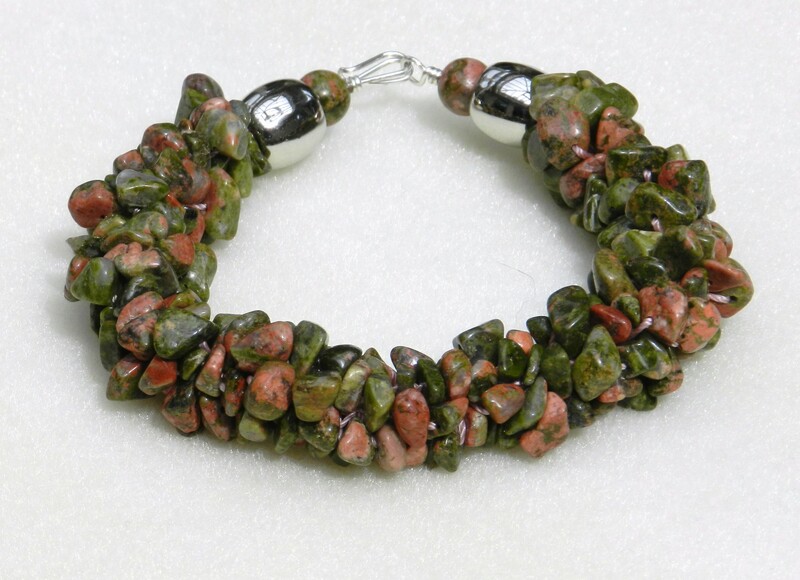 Gemstone chips can be given a little helping hand by adding Long Magatama beads. A glimpse of silver through the braid ties in with the clasp colour and shiny black beads are used to highlight the spiral effect of round braid. Alternatively add some sparkle and colour in the form of crystals in a darker colour or in a contrast colour. Bicones, Rondelles or round crystals all work well. – Silver Long Magatamas on one cord (32) and black Long Magatamas on 3 cords (1, 16 and 17). All threaded in the same direction. This tutorial was written to use small lucite flowers. 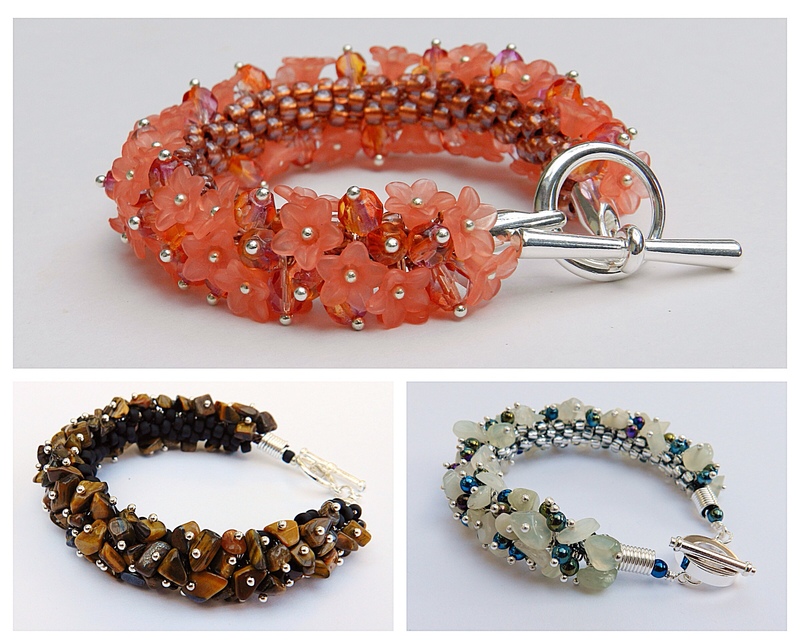 However, it can easily be adapted to make a range of fabulous gemstone chip bracelets. 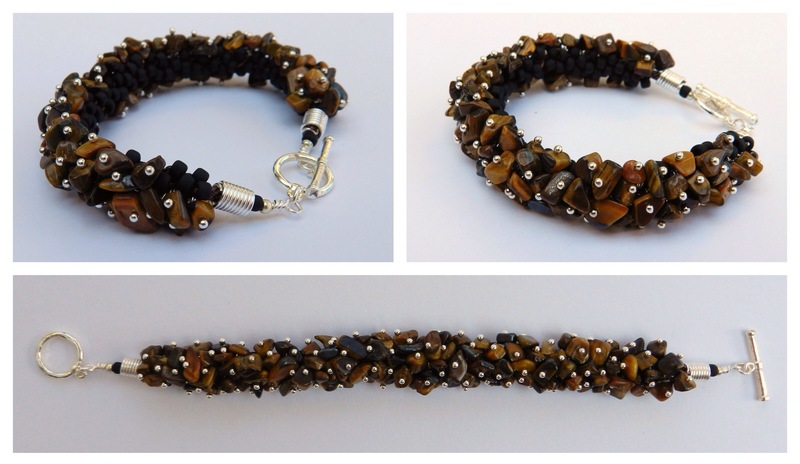 The great advantage of this design is that the chips sit on the outside of the bracelet while the seed beads sit next to the wrist. This has both the advantage of being very comfortable, while also being very economical with the chips! Please note that a simple wirework technique is used in this design. It is fully explained, but a basic plier set is required to complete the bracelet. To have a go at this beautiful design, you need to purchase the Precious Posy tutorial. Then you need to substitute all the flowers and the bead units for chips. Thread on the beads as shown in the chart in the tutorial. The chips will be positioned on the outside 0f the bracelet and the size 6 seed beads will be on the inside, next to the wrist. Any chips of medium size will work well with this design. If you want to use the very small chips you will need to use size 8 seed beads and thread on 10-15 extra beads onto each cord by following the chart from the top again. If you need any help or advice please contact me using the contact details on this site. If this design is something you would like to try, you will need to buy the Precious Posy tutorial. 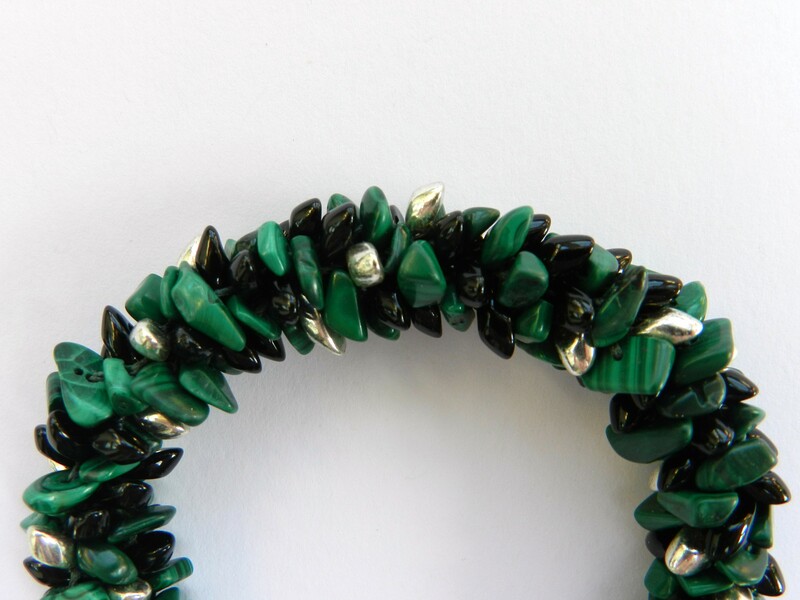 Substitute jade chips for each flower and use a 4mm rainbow haematite bead in each of the bead units. I can be contacted by email using the contact details on the site in the event that further help is needed.